(The Root) — If you're a strong believer in maintaining the status quo, the outbreak of voter-identification laws across the nation just might make sense. If you're a student of American politics and history, on the other hand, you see it slightly differently. In that case, what you see is what we've got: voter suppression. Thirty-three states, almost all of them Republican-controlled, now require some sort of voter ID. A decade ago, none did. A decade ago, there was no evidence of massive voter fraud. Today, there remains little evidence of voter fraud. But there is clear evidence that the rash of voter-ID laws could have a profound impact on African-American participation at the polls. As Attorney General Eric Holder pointed out at the NAACP convention earlier this month, recent studies show that 8 percent of white voting-age citizens lack a government-issued ID, while 25 percent of black voting-age citizens lack one. Considering that Barack Obama received 95 percent of the African-American vote in 2008, if you think Republicans might be interested in suppressing that vote, you might be right. Take the Lone Star state, for example. Since 2002, there have been only two documented cases of a Texan being convicted for voter impersonation fraud. But last year, a voter-ID law was passed as an "emergency item." Under the proposed Texas state law, concealed handgun licenses would be acceptable forms of photo ID while student IDs would not. Some voters would need to travel 100 miles in Texas, particularly Hispanics, to designated government offices just to get their photo IDs; others would be hard-pressed to pay for the documents needed to get the IDs. The currently contested law, if implemented, would make it easier to buy a gun than to cast a ballot in Gov. Rick Perry's state. Texas is one of 16 mostly Southern states with a history of discrimination required by the Voting Rights Act to get pre-approval from the U.S. attorney general or the U.S. District Court in D.C. for changes in voter procedures. Understanding that Holder would be a bad bet, the state is gambling on the District Court in D.C. ruling in its favor. After a weeklong trial, a three-man panel will announce its judgment later this month on whether Texas is up to its old voter-discrimination tricks. Unfortunately, the Lone Star state is not alone in adopting restrictive voter-ID laws as a tactic to discourage African-American and Latino voters from showing up at the polls. As is the case in some of the problems Americans face today, we can blame it on George W. Bush. In the aftermath of the Florida fiasco that led to the Supreme Court declaring Bush president, Americans became desperate for measures that might stem voter fraud. Halfway through his first term, Bush signed the Help America Vote Act into law, which required first-time voters in federal elections to show some form of ID during registration or at the polling place. The same fab five right-wing activist justices on the Supreme Court who ruled that corporations are people also gave Indiana's ID law a nod. Like dominoes falling, Alabama, Georgia, Kansas, Mississippi, Tennessee, Wisconsin and Pennsylvania have followed with restrictive laws requiring voters to show up with photo IDs in hand — even though in 2007, five years after the George W. Bush administration launched a crackdown on voter fraud, the Justice Department found virtually no evidence of organized efforts to influence federal elections with ineligible voters. 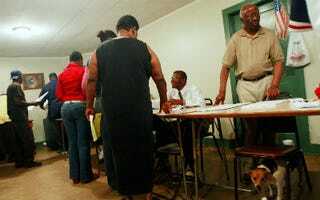 A study by New York's Brennan Center for Justice last week reported that 1.2 million eligible black voters and 500,000 eligible Hispanic voters in the nation live more than 10 miles from their nearest ID-issuing office open more than two days a week. It also reported that "these voters may be particularly affected by the significant costs of the documentation required to obtain a photo ID. Birth certificates can cost between $8 and $25 … By comparison, the notorious poll tax — outlawed during the civil rights era — cost $10.64 in current dollars." Just why would Republicans want to make minority voters, who don't have and don't need photo IDs in their day-to-day lives, cough up extra cash or go far out of their way in order to exercise their civic duty? And why, oh, why are the Republicans hand-wringing over non-existent voter fraud? Let's see. As polls have consistently shown, President Barack Obama and presidential hopeful Mitt Romney are locked in a dead heat. Depending on who's counting, there are 10 to 12 swing states that will determine the outcome of November's election. Among those battleground states, Florida, Colorado, Nevada and North Carolina are heavily populated with either Hispanic or black voters who could make a difference. But that's only if they show up and are allowed to cast their ballots. And, as we all know, stuff happens. Let's just make sure it doesn't happen to us.